Should you take these things seriously? After my last gun-related post, you might think I would try for something more light-hearted. But, alas, you would be wrong. In the news around here lately have been a few somewhat-related subjects, at least to me. I have mentioned one topic before, the Western Psych shooting. Recently, things have come out that suggest the shooter was disturbed enough that something should have been done before the shooting ever occurred. Among other things, he went to UPMC Shadyside with a baseballbat twice in 10 days to threaten employees. But yet no one thought to call the police or refer him for a mental health evaluation. Did the employees just not take it seriously? Did it fall through the cracks? I have been absent from the blogging world for a little while. Last Tuesday I received a phone call asking if I was interested in coming in for an editing test for a temp-to-perm job (I had missed the email about this from the day before). The next day (Wednesday), I took the test, had a brief interview, and then found out that evening I did well enough to warrant a second interview the following week. The morning after (Thursday), I received another email asking if I could instead come in on Tuesday to start a project. Just a day later (Friday), I was asked if I could come in on Monday instead. So I did, and I spent several days this week working on the project, mostly in the office and some at home. I don't know what will come of this; it is fast-paced, and I have been away from the business world and a daily commute for three (!) years. And there is a lot to absorb. But whatever shall be, shall be. But back to my post title. In honor of Sidney Crosby's second comeback from his concussion-recurrence symptoms, I thought I would share how I came to love hockey. 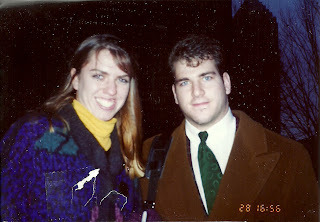 I "discovered" hockey when I was a freshman at Penn State, from 1989 to 1990. Growing up 45 miles east of Pittsburgh, I certainly knew of the Pittsburgh Penguins, but they just weren't that good (in fact in the '80s, they were pretty bad), plus hockey was not exactly in vogue back then. The only player I had heard of was Mario Lemieux, but his greatest was not enough to get me interested in hockey prior to my going to college. When I started my thank-you note project, I had high hopes. There were so many people who deserved short, but thoughtful, notes, and surely I could find those people. But this task has proven more difficult than I had imagined. A week ago, I decided to email the woman who runs the fish fry at our church/school. If you have been to a fish fry, you know how hectic and busy it can be. I volunteer for a shift every year, and it is hard work, but it does not come close to what M, the woman in charge, does--scheduling people to make sure there is enough help, setting things up, keeping track of food, telling people what to do, answering questions, stepping in as needed in addition to running the kitchen, and probably a dozen other things I don't even realize. She works so hard to prepare for this weekly Lenten event, and when the actual night comes, she is grace under pressure. I am unsure how many times in my life I have questioned why people do the things they do. I have probably done it in this blog a half dozen times or more. I know I wrestle with this at least weekly. I get that people have free will. Any one of us can decide on any given day, hour, or minute whether we are going to do something good or something bad. Something that will help others or something that will hurt others. Something that is "right" and something that is oh-so-wrong. I realize that most of us don't generally do really good or really bad things; we just live our lives. Sometimes we perform a random act of kindness and we are hopefully mostly nice to our family and friends. Other times we say something unkind, are not truthful, and do things we probably should not. But the truth is, I grapple with those little wrongdoings as much as I struggle to wrap my head around the really heinous things people do. Right now I am sitting here waiting for two HVAC companies to give me revised quotes. We originally met with four different companies, one of which was our current one, another was recommended by a friend, and the other two we found via the Monroeville Home Show. This process is nothing like when we got new windows two years ago, which was challenging enough for me. We have received quotes for five different brands (Carrier, Comfortmaker by Carrier, Bryant, Lennox, and Trane). And the varying options are almost dizzying (single-stage or two-stage, 95 or 96 percent efficient, ECM or some other motor, 13 SEER or 16 SEER). Prior to last week, I had no idea there were so many variances. In the middle of January, I blogged about how my 2.5-year-old tires had worn out with fewer than 27,000 miles on them. When I got my new/replacement tires, I tried to convince the Flynn guy that rather than my paying his quoted price of $500 to replace the tires, I instead should pay less than half of what the last set cost, which was a little less than $750 (so less than $375; you are welcome for the math). The Flynn guy explained that Goodyear does not make those tires anymore, so I needed to be moved up to a better (i.e., more expensive) tire, and on top of that the price of rubber has gone up. But, he said, if I used my Goodyear credit card, I could get a $120 rebate, so in his eyes I would be paying about half of the original tire cost. His answer did not satisfy me, but I dropped it. Until two days ago.